Is your bedcover getting stained while giving an oil massage to your baby? Then go and get the Little's Baby Mat, on which you can lay your little one while giving the massage and get rid of all that mess. Little's, India’s oldest establishment of Tata, has always been a popular brand manufacturing baby products. Now comes Little's Mat, which is made of special imported PVC and non-toxic plastic. The little colourful images of teddy bear, flowers and other attractive things make the mat attractive for your kids. The dimension of the mat is 29 x 20 inches and suitable for babies upto a maximum of 2 years. The soft and comfortable baby mat is just perfect for your baby’s delicate skin. While giving the oil massage, it is not possible for you to lay your baby on the floor, and if you lay him or her on any cloth, it gets oil stained. So in such cases, this plastic mat is just the perfect product. It is long-lasting and easy to clean. You can even use it not only while giving the oil massage but also during the baby’s playtime. It is actually a very useful product and really comes handy. Since you are using the mat for your precious little bundle of joy, you should therefore ensure that it is hygienically cleaned after every use. 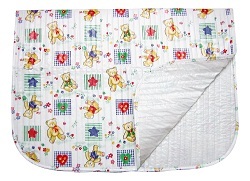 The mat will give your baby real comfort and keep him/her happy. So get the Little's Mat today which will save you from all that mess and also keep the baby dry and comfortable.